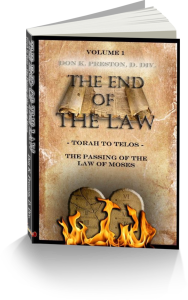 The End of the Law of Moses was the time of Reformation – in AD 70. The writer of Hebrews said that the Law of Moses, including the entire cultic world of sacrifices, festal observances, washings and meats and drinks, was “imposed” (From epikeimai / epikeimena, ἐπικείμενα , Strong’s #1945) “until the time for reformation.” The word reformation is from diorthoseos, διορθώσεως, Strongs’s #1347). This installment in this series will seek to define what the time of reformation truly was. Many, if not most, commentators posit the full arrival of the time of reformation at the cross. This is not the case, and cannot be the case, however. A comparison of Hebrews 9 and Acts 3 proves this. In Acts 3:19-24 Peter anticipated the arrival of the “restoration of all things.” The word restoration is from apokatastasis, (ἀποκαταστάσεως, Strong’s #605) which means to put back in order, to restore, to make things right. Both diorthosis and apokatastasis are often used in external sources to speak of setting a broken bone. It was used of political reforms as well. In the Tanakh, the word was used to speak of the literal restoration of Israel from exile, the return from Assyria or Babylonian captivity. In Jeremiah 16:13-15 Jeremiah told Judah that they were about to be removed from their beloved land. Yet he also promised, “I will bring them back (LXX, apokatastasis) into their land which I gave to their fathers” (My emphasis, See also 24:6). This promise was fulfilled under Ezra and Nehemiah (Ezra 1;5;6; Nehemiah 9:36f). (The roman numerals LXX (70) stands for the Septuagint, the Greek translation of the Hebrew OT The number 70 traditionally represents the number of Jewish scholars that did the translation work). But, apokatastasis was also used to speak of the restoration of Israel under the Messiah. For instance, Jehovah also promised to restore Israel under the righteous “Branch,” of the line of David, under whom Judah and Israel would be restored (Jeremiah 23:5f). This is the true restoration of Israel. There are several such Messianic uses of apokatastasis in the Tanakh (cf. Jeremiah 23:8). Elijah, the restorer, was to urge Israel to, “remember the Law of Moses.” Thus, the framework of “restoration” was within the confines of Israel’s world. He was not to be a prophet to the nations per se. The work of Elijah was eschatological; he was to appear before the Great and Terrible Day of the Lord (Malachi 4:5-6). (See my book, Elijah Has Already Come; A Solution for Romans 11:25-27 for a full discussion of the work of John the Baptizer as Elijah. Thus, the work of restoration anticipated – and pointed to – the Day of the Lord– the time of reformation in Hebrews 9:6-28! Thus, restoration before parousia, not parousia then restoration. This fits well with the context of Acts 3. Peter says Christ would come at the climax of restoration. Notice that Peter said the restoration of all things was the object of the prophets, and they “spoke of these days”(Acts 3:24) – the days before the parousia. Peter’s “these days” were not far distant days. They were Peter’s days. In 1 Peter, that same author / speaker, anticipating the arrival of the eternal inheritance, said that it was “ready (hetoimos) to be revealed (1 Peter 1:5f) at the parousia of Christ. In chapter 4, he stated in unequivocal terms “the end of all things has drawn near”; “the (appointed) time has come for (the) judgment” (1 Peter 4:5, 17). Now, unless one is able to demonstrate that the about to be revealed parousia, to bring the eternal inheritance, which would be at the time of the end, that was upon them, then this means that the climactic restoration of all things – no matter how we wish to define it – was upon them – 2000 years ago. Was Peter anticipating a totally different eternal inheritance from the restoration of all things? Where is the proof? In a FaceBook exchange with Mr. William Vincent, in July of 2018, (Preterist Discussion and Debate) I took note of the restoration work of John as Elijah, being the same as the restoration anticipated by Peter in Acts 3. Amazingly, Mr. William Vincent rejoined that since the word “restore,” used by Jesus to describe John’s work as Elijah, was a verbal form of apokatastasis, whereas, in Acts 3, it is a noun this meant that these must be different restorations! To say this is specious is an understatement. John’s “restoration” work was to prepare for the Great Day of the Lord. The restoration of Acts 3 would take place before the Day of the Lord but would be consummated at that event. So, to suggest that these are two radically different restorations has no merit. Mr. Vincent’s suggestion would demand two different comings of the Lord, would it not? The point is that in the Messianic prophetic literature, apokatastasis was used of the coming Messianic Kingdom – Israel’s restoration (radical transformation!) through the New Covenant and Messiah. Likewise, the word translated as “time of reformation” (Hebrews 9:10, from diorthosis) is a synonym for the restoration. Like the “restoration” this time of reformation was the goal of Israel’s prophetic hope. It was the time when God would restore her. It was the time when she would finally receive forgiveness, and God would bring man into His presence. Her exile would be over. In Isaiah 62:7, in the LXX, Jehovah promised the restoration of Israel. Jerusalem would be established (diorthosis). This restoration would occur at the coming of Jehovah in judgment and salvation (Isaiah 62:11f). This would be the time when the Lord would “remarry” Israel (Isaiah 62:4f). Isaiah’s promise of the coming of Jehovah in judgment is the basis of Jesus’ promise that he was coming in judgment (Matthew 16:27). So, the diorthosis was the time of Israel’s restoration. The Old Covenant prophets, in speaking of the restoration of Israel under the Messiah, used apokatastasis and diorthosis as synonyms. These words are used interchangeably in the prophetic corpus. In our next installment, we will examine the amazing significance of these words as they apply to the passing of the Law of Moses, and the story of eschatology. Stay tuned! In the meantime, get a copy of my book, The Passing of the Law of Moses: Torah to Telos, where I discuss these and other issues. For a study of The Time of Reformation, get this book!